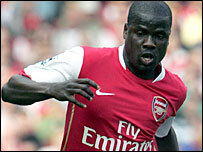 Emmanuel Eboue is determined to cement his place as first-choice on the right side of Arsenal's midfield. The 24-year-old originally started out as a defender at the club but Bacary Sagna has pushed him further forward. Eboue's place is under threat after the resurgence of Theo Walcott but the Ivory Coast international is out to show he deserves to be a regular. He said: "I have enjoyed playing there. The manager asked me to and I felt I could do a good job in that position." Eboue added: "It was not easy, first because it is such a different position to right-back. I needed a bit of time to adapt myself and I feel that, little by little, I got better. "I have worked very hard to change my game to be able to play in midfield. Now, I want to keep playing there and keep improving to become a better right midfielder. "I need to do better and be more effective next season. I want to show the coach that he got it right by asking me to play there. I want to pay him back." Despite Arsenal seeing their dreams of the Premier League title and also European glory evaporate over the last nine weeks, Eboue insists the Gunners can take great pride from their campaign. He continued: "We don't have to be ashamed of our season. "We have given everything we had, it was not our time but we have learnt a lot this season. All the members of this squad have matured so much. "We have all developed into better players and we will definitely come back stronger after what happened to us this year."